A divorce typically affects all of the members of the family concerned. When the separating couple has children, even the grandparents may experience a certain loss. If children are involved, the divorce proceeding likely will include either an agreed-upon parenting arrangement or a court-ordered one. Unfortunately, in many cases, the court must get involved to allocate child custody and visitation, taking into account the best interests of the child or children. Courts have the statutory authority to grant grandparents visitation rights under certain circumstances. If you are considering divorce and want to be sure that your rights will be protected, you are encouraged to contact an experienced family law attorney as soon as possible. In California, there are three separate laws that expressly address grandparent visitation: Family Code Sections 3102, 3103, and 3104. In a recent divorce case, the court was asked to interpret and apply Section 3104 (a), which provides in part that a grandparent of a minor child may petition a court for reasonable visitation rights. In order to grant the petition, the court must: 1) find that there is a preexisting relationship between the grandparent and grandchild that has created a bond rendering visitation in the best interests of the child; and 2) balance the interest of the child in having visitation with the grandparent against the right of the parents to exercise their parental authority. In this case, the child at issue had a consistent and strong relationship with her grandparents prior to and after her parents’ divorce. For a period of time, the grandfather was the child’s primary caregiver while her parents were at work. After the divorce, the child and her dad moved in with the grandparents. But at some point the relationship between the father and his parents deteriorated, and the two moved out. At this point, the father refused to allow his parents (the child’s grandparents) to see his daughter. Although the child’s mother at first allowed the relationship to continue, she later chose to side with the father (her ex-husband) and not permit the grandparents to see their child. The grandparents petitioned a California court for visitation in 2013. A mediator met with the parties and ultimately recommended grandparent visitation, pointing out that the bond between the child and the grandparents was “quite strong” and that the child suffered harm as the result of her parents’ decision to keep her from them. The trial court granted the petition, concluding (among other things) that there was a preexisting relationship between the child and her grandparents that created a bond, rendering visitation in the child’s best interest. The court balanced this interest against her parents’ right to exercise their parental authority and concluded that the child’s interests prevailed. The father appealed and raised several arguments. In part, he challenged the constitutionality of the statute and how it applied to his case in particular. The court of appeals reviewed the facts in the case, the language of the statute, and relevant case law, and it concluded that the parents being deemed “fit” does not preclude a court from ordering grandparent visitation. The court upheld the trial court’s decision to grant grandparent visitation under the facts in this case, finding that it was in the child’s best interest to continue the relationship. Clearly, divorce cases involving children are fraught with intense emotions and practical challenges. Protecting your family’s rights is of the utmost importance. An experienced family law attorney would be able to navigate the process with a determination to protect your rights. 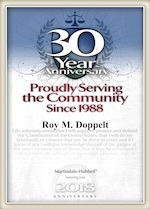 Roy M. Doppelt is a seasoned divorce attorney who has more than 20 years of experience assisting clients in San Diego and throughout the State of California with all of their family law needs. To schedule a free confidential consultation, call Doppelt and Forney, APLC toll-free at (800) ROY IS IT (769-4748), or contact us through the law firm’s website.